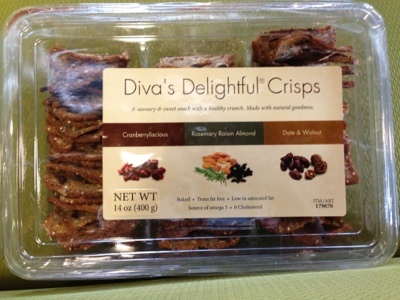 Grandma Fifi: Independent Costco and Aldi Blog: Diva's Delightful Crisps...Rosemary? These cookie-like crisps contain dried fruit and nuts and make a nice chewy, low calorie snack. I saw them for the first time last week at the West Nashville Costco, back by the bakery. When I brought these to the Nashville Food Bloggers' workshop last Saturday, people liked them. One young blogger, Melissa Corbin from Corbin in the Dell, said, pointing to the crisps in her hand and mine, "I particularly like this kind, but, then, I like savory." "But the savory ones are supposed to have rosemary?" I said. "Oh, yes! I can taste the rosemary in this!" I've eaten many of these crisps by now; and, I can't tell the three varieties apart. It must be my old lady taste buds. These are the most wonderful crackers .Great with chicken salad,cheese spread or by themselves. Impossible to find one of my costco stores does not carry it and the other said it immediately sold out where can you find, them? OMG OMG Thank you, Kimberly!